this is the story of a pomegranate, quite an ordinary pomegranate who would have been content to simply continue being a pomegranate in peace before dropping quietly to the ground to end its life and spread seeds to help bring about the next generation. one mild day, the pomegranate found itslef wrenched away from its happy branch on its tree. Shaken and disoriented, the pomegranate realized that someone was CUTTING it! 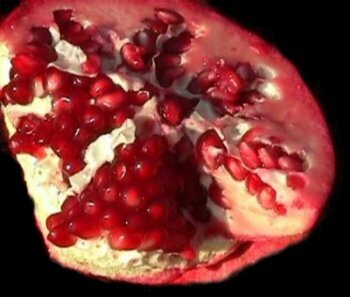 It could not scream out in fear as it was half-consumed by the strange ones or when they had had enough and decided to discard the pomegranate, tossing it without a care into a can of GARBAGE! This is when the pomegranate achived self-realization. Still bearing its battle scars, the pomegranate knows now that the world is less than perfect. And of course, the only way to change this sad state is to gain complete control of the world so as to make it a kinder, gentler state. After all (says the pomegranate), most of the people today who're trying to rule the world are self-centered tyrants. I would be a kind, caring dictator. I've always been a gentle pomegranate. So now you know the mission of this site. Having been clever, the pomegranate decided to start out small. So it enlisted our aid (of course!) to show that it is fun-loving and non-threatening while fulfilling the important task of keeping Babylon 5 and some other select things alive, for Babylon 5 is our last, best hope for peace, and the other things are pretty cool too. so enjoy, and remember--the pomegranate is here for you!